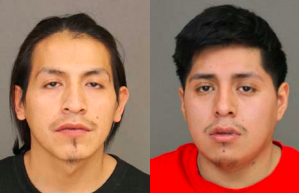 Daniel Salto, 21, and John Salto, 23 have been arraigned on attempted murder charges following a January 22 stabbing incident outside of Mi Tierra bar in the Village of Haverstraw. The cousins, who live at the same Singer Ave., Spring Valley address, face one count each of attempted murder in the second degree and assault in the first degree. Both charges are class B violent felonies. John Salto faces an additional charge of attempted assault in the second degree, a class E felony. District Attorney Thomas Zugibe said in a press statement that on January 22 at approximately 2:20 a.m., the defendants, acting in concert, repeatedly stabbed a male victim during a violent confrontation outiside the Mi Tierra bar, located at 5 Broadway in the village. erupted with another individual. The confrontation turned physical when the parties exited the lounge onto Broadway. An eyewitness identified the defendants as those who stabbed the victim several times before attempting to flee the scene. possessing the knife and using it to stab the victim. John Salto was arrested several days later. The victim suffered 12 stab wounds and required surgery at Westchester Medical Center. The stabbing incident was captured on surveillance video. Zugibe said the video shows the defendants using deadly physical force, even though the victim did not pose a significant threat of death or serious physical injury. Daniel and John Salto were arraigned February 20. Bail was set for Daniel Salto at $100,000. His next court appearance is scheduled for March 21. John Salto’s bail was set at $25,000. His next court appearance is scheduled for February 28. Both defendants face up to 25 years in state prison, if convicted.